Ed and I took a day trip to Manotick, Ontario, Canada to see a flour mill demonstration at a 150 year old mill (see post about Watson’s Mill here). 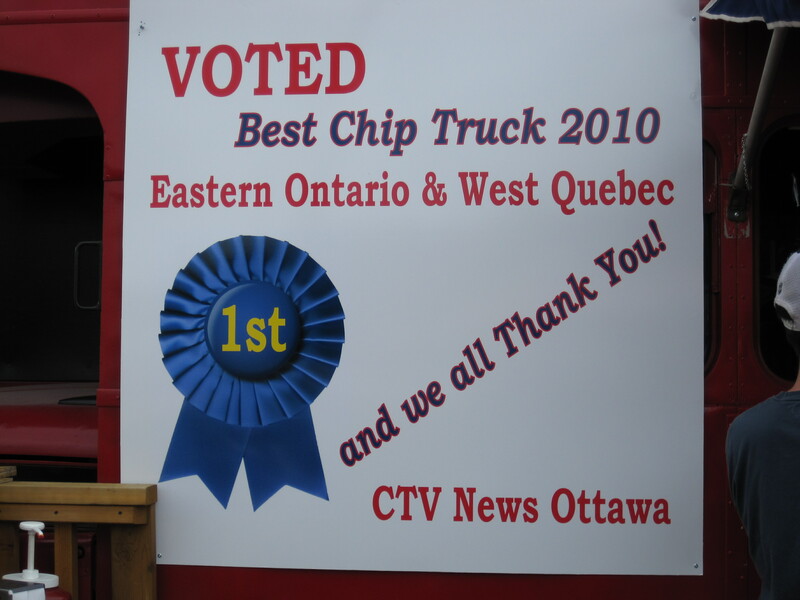 While we were in that small town, we discovered [by chance] a double decker chip truck that was voted the 2010 Best Chip Truck in Eastern Ontario and Western Quebec on CTV news! I can’t even describe how excited we were to find it 🙂 This was one of the best random food discoveries we’ve ever made. The CTV Best Chip Truck trophy sits proudly in the ordering window. 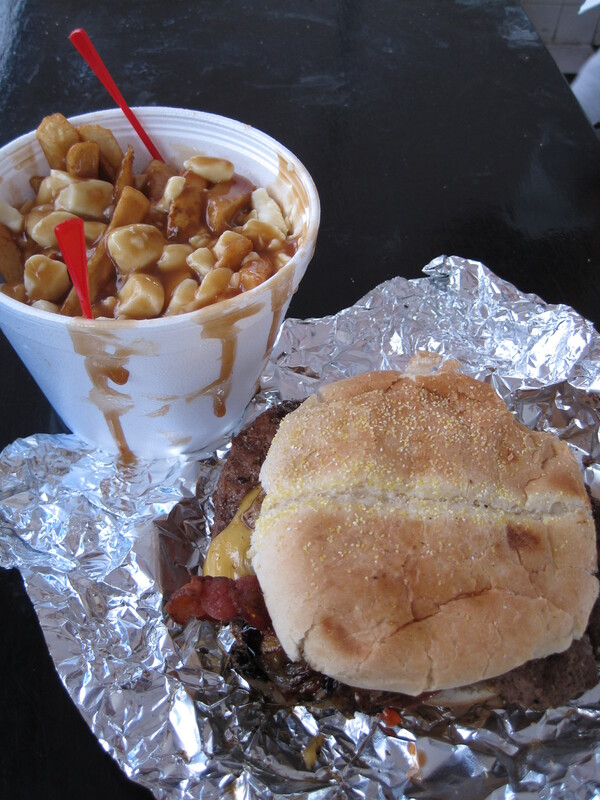 We ordered the “big ben” burger with “everything” and a regular sized poutine. Regarding the “big ben”: The burger came with one and a half meat patties. Apparently, their burgers are hand made. I didn’t like the texture of the meat as it was ground too finely for my taste. But we really liked the toppings: mushrooms, carmelized onions, bacon, cheese, tomato, and pickles. I should note that the burger was slightly pink on the inside. The temperature was hot to the touch (and we were starving after the long wait for our food), so we ate it anyways and neither of us got sick. Regarding the poutine: I love poutine and I’ve had it at many different places throughout Ontario and Quebec, Canada, from fast food joints (and chip trucks) to fancy restaurants. The poutine I had from this chip truck made it on to my top 5 poutine list. The ratio of fries to gravy and cheese was just right. The fries were standard but good; the gravy was flavourful, not too thick and not too salty; and the cheese curds were just the right amount of squeaky for both of our tastes. I appreciate both the poutines that use traditional cheese curds as well as those that use melty cheeses, but Ed doesn’t like the cheese curds that are really rubbery. 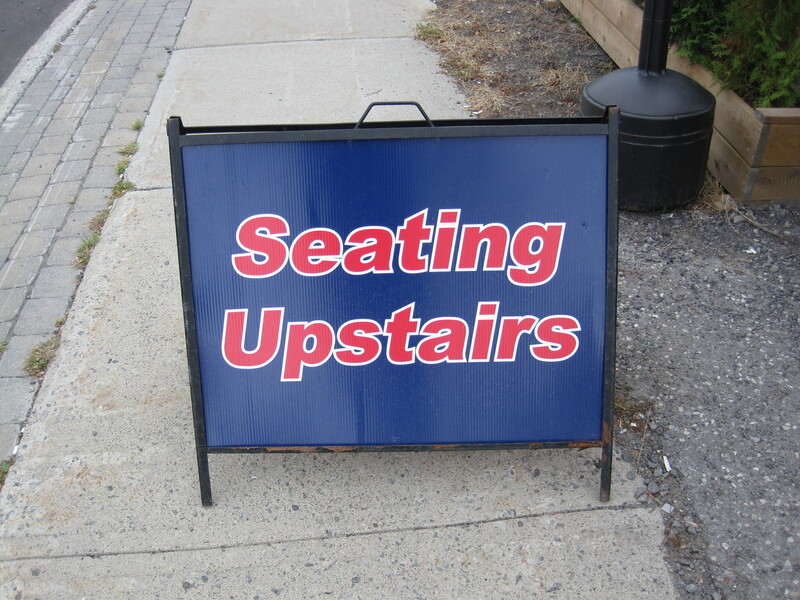 Service: We went on a Sunday in the late afternoon and we waited about 30 minutes for one burger and one poutine. I imagine the wait would be horrendous during peak meal times. 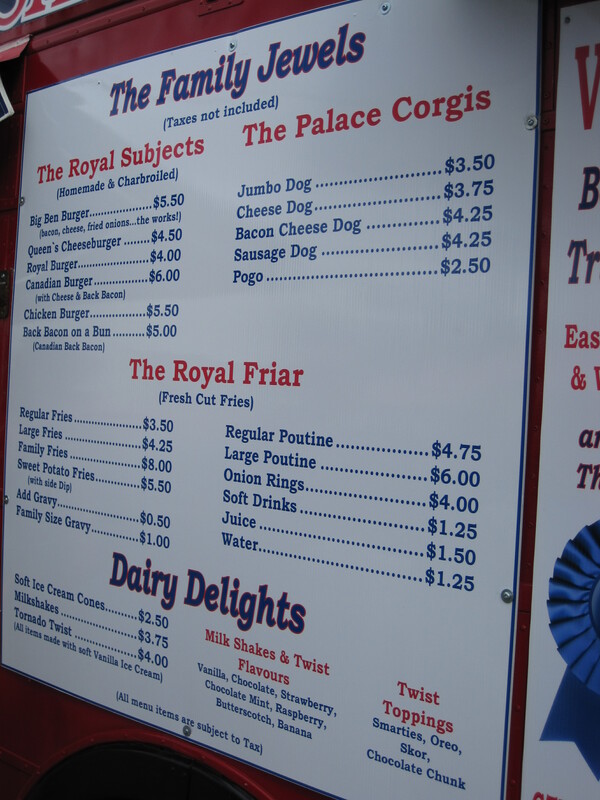 So if you’re in a hurry, stick with the deep fried selection, as it was the burger that took forever. Would I wait again? Absolutely (for the poutine, that is). 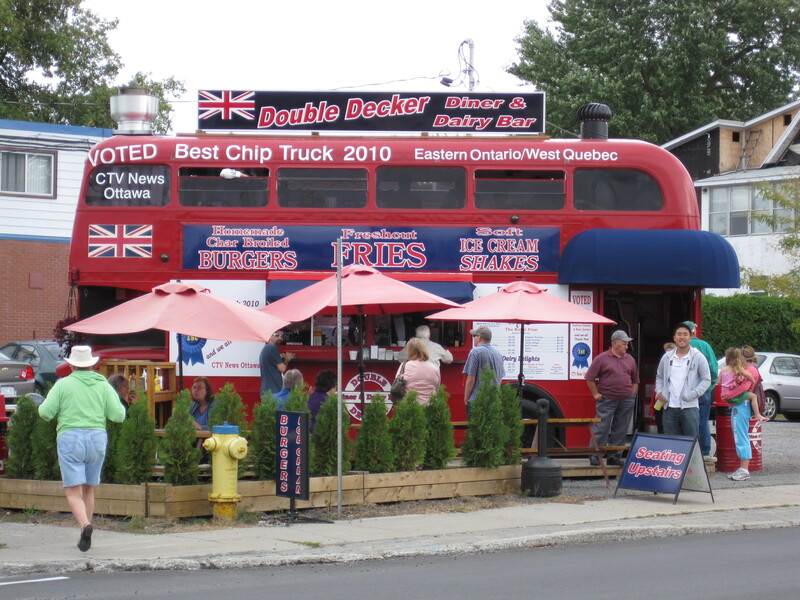 The best apart about this chip truck, aside from the poutine, is the diner on the upper level! 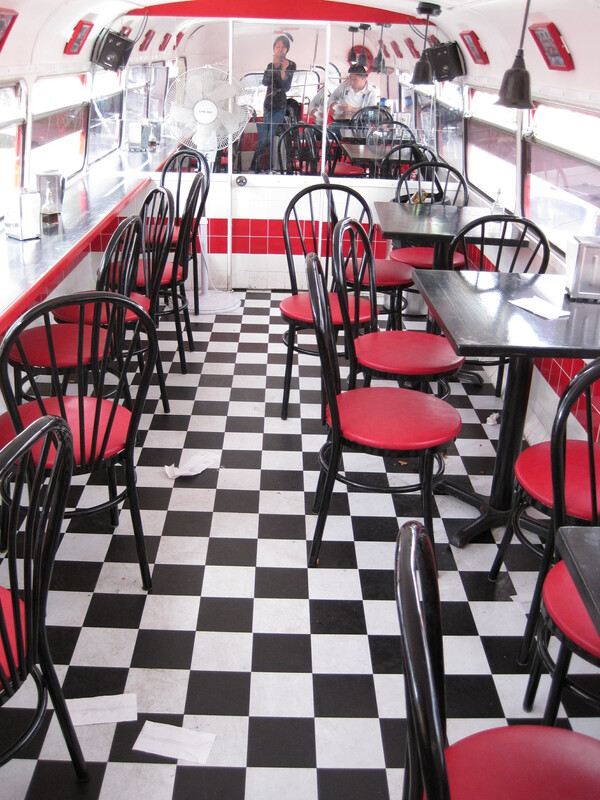 The upstairs of this double decker bus was converted into a 1940’s diner. Small photos of different vintage, red double decker buses are framed and displayed above the windows. Delicious! I remember this meal quite clearly. Hello, I’ve been a frequent visitor to the Double Decker over the summer. I came accross your review and I would just like to point out that the day of the Watson’s Mill 150th event was indeed a very busy day of business. I would consider that entire day busier than their normal “peak meal times”. The wait during busy days as this one is usually 15-30 minutes as they usually warn the customers ahead of time. So there’s no worry, the wait doesn’t get any more horrendous then you experienced. Also they have a sign at the counter that states “Burgers may appear pink under red umbrellas.” Just thought I’d mention that if you hadn’t noticed. The sunlight from the red umbrellas often gives a pink tint to the meat of the burger but if you go out in the sun and take another look you will notice it’s actually a cooked burger. And I agree! Best poutine I’ve ever had! 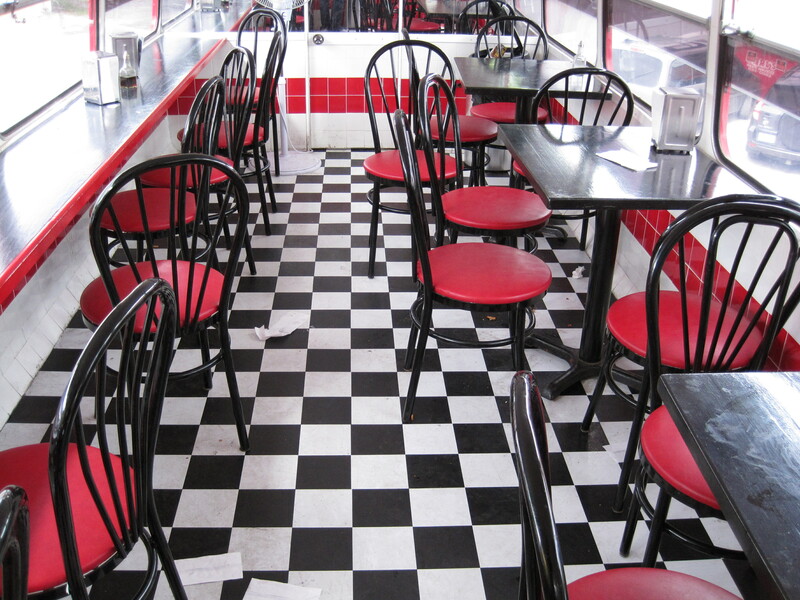 The whole retro diner theme really gives the place a unique feel. I, too, love the experience of eating there. Thank you so much for your comment! The weekend that we went was near the end of the 150th year so we weren’t there for the big event. But I believe you when you say that it’s normally less busy 🙂 Also, we ate our burgers in the dining room upstairs so I wonder if those lights would make the burgers look pink too? Thank you for checking out my review! How lucky that you get to frequent the Double Decker!